Tag line: "Peace. Harmony. 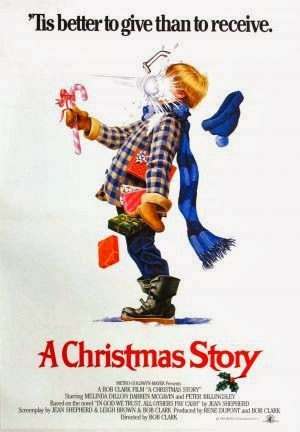 Comfort and Joy... Maybe Next Year"
Bob Clark’s 1983 film, A Christmas Story, gets regular play on U.S. cable channels throughout the Holiday season (Turner Broadcasting even repeats the movie, non-stop, for 24 hours straight beginning on Christmas Eve). As a result, some people have grown tired of it. Yet, in spite of the onslaught of repeat showings, A Christmas Story stands with Dickens’ A Christmas Carol, It’s a Wonderful Life, and Rudolph, The Red-Nosed Reindeer as one of the absolute best Christmas stories ever told. The year is 1940, and Christmas is just a few weeks away. The only gift that young Ralphie (Peter Billingsley) wants is a Red Ryder BB gun. Unfortunately, his mother (Melinda Dillon) refuses to buy it for him, fearing he’d “shoot his eye out” with it. But Ralphie won’t give up without a fight, and over the course of the next several weeks, he’ll write a school report for his teacher, Miss Shields (Tedde Moore), praising the Red Ryder, and even ask Santa Claus (Jeff Gillen) to bring him one. Will Ralphie get the Holy Grail of Christmas presents, or is this particular Holiday season destined to be a disappointment for him? This is the basic premise of A Christmas Story, but Ralphie’s quest to land a Red Ryder air rifle is just one of literally dozens of stories, most of which are funny as hell; like when Ralphie’s father (Darren McGavin) wins a “major award” that turns out to be a lamp in the shape of a woman’s leg, or when Ralphie’s friend, Schwartz (R.D. Robb) dares their other friend, Flick (Scott Schwartz), to put his tongue on a frozen lamppost. From the Little Orphan Annie Decoder Ring to the “Life Buoy Soap” fiasco, A Christmas Story is chock full of hilarious sequences. Among my personal favorites are the “Scut Farkas (Zack Ward) affair”, which deals with a “yellow-eyed” bully who torments Ralphie and his friends; and the visit to Santa Claus, where Ralphie’s hopes and dreams are once again dashed. Narrated by humorist and long-time radio host Jean Shepherd, whose novel In God We Trust, All Others Pay Cash inspired the movie, A Christmas Story is more than a Holiday film; it’s a tradition, one that (if cable TV has its way) will undoubtedly continue for many years to come.